There are a lot of inaccuracies in any show about the end of the world, but one very positive thing about shows like The Walking Dead or movies about natural disasters is the preparedness dialogue that frequently comes about as a result. Just imagine: as you’re reading this, whether you happen to be at home, on the road, or in the office, catastrophe strikes. What would you grab? (Or does that question assume too much? After all, if you don’t have anything with you it might be difficult to pick it up.) The fact is, with the exception of off-duty LEOs and a select number of civilians with concealed carry permits, not very many people could react to a hostile situation at all, and even among those, it’s unlikely that the majority would have first aid materials, a source of potable water, or other necessary supplies. Arguably, the easier it is to take all of those things with you, the better the chance is that you might have it with you when you need it, and that is perhaps the biggest benefit to US Peacekeeper’s Rapid Deployment Pack. It’s big enough to hold important supplies and small enough that it isn’t a hassle to make sure you’re able to take it with you. 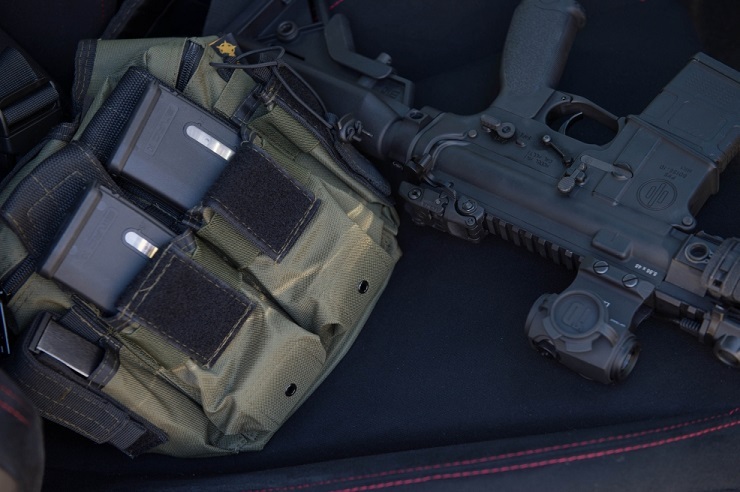 For those of you who keep a rifle at the ready, the concept of this bag is simple: it keeps extra ammo and essentials right there with the gun. For those of you who know you could only ever expect to have a handgun with you, each of the two rifle magazine pouches will also hold 3-4 single stack .45 magazines, or two double stack Glock/M&P/HK mags. This is especially important because a lot of people have a gun at the ready but no extra ammo, no first aid kit, and no survival gear. That would probably be a miscalculation, especially given the odds of needing some of those forgotten items in an emergency. 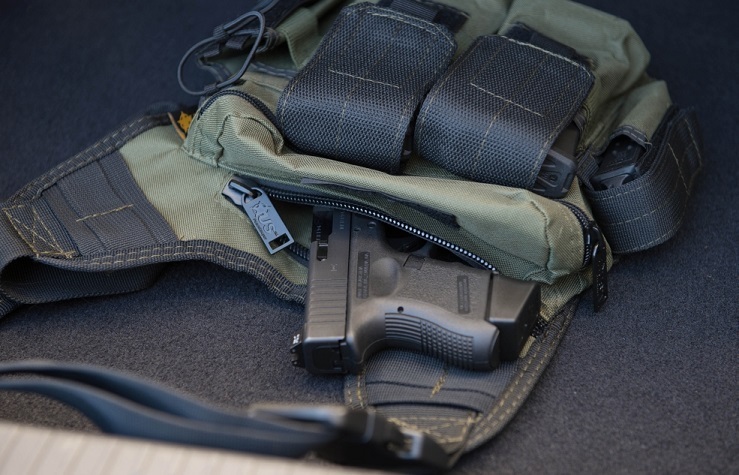 In a home defense scenario, having a shoulder bag with reloads at the ready is a quick and effective way of taking anything you need with you, whether or not you’re wearing clothes or a belt. Likewise, in the event of a natural disaster, there may only be time to grab a couple of things, and something like this makes sure you have at least some necessities ready to go. Between LE and civilians, the list of what to include will certainly be different, but there are also some similarities. Both groups, for instance, would be wise to carry additional ammunition for whatever small arms they know they will have with them. Both groups might also want to pack a flashlight with extra batteries (especially if your light uses 123A lithium cells that might be tough to find on the move), blood clotting agent, and additional first aid equipment. LE might want to include a tourniquet or a radio (a tourniquet might be good for anyone), but would likely omit a handgun in favor of more ammunition or supplies, because there is a good chance that’s already on their belt and possibly in a backup holster as well. Civilians with a propensity for the outdoors might include outdoor survival necessities like a firestarter, a water filter (or purification tablets), and an extra pistol, especially if their concealed carry is a pocket gun and there’s a chance they might need more stopping power in an emergency situation. Anyone could always use an extra knife with some good serrations on it in the outdoors, and some gloves or a thermal blanket might be useful if it gets cold in your area. Another cool feature is the metal clip on the strap that is great for holding a water bottle or canteen. I always keep my Leatherman tool in there as well, as it has a lot of useful features in a compact package. And if you wear glasses, this would be a great spot to keep an extra pair. 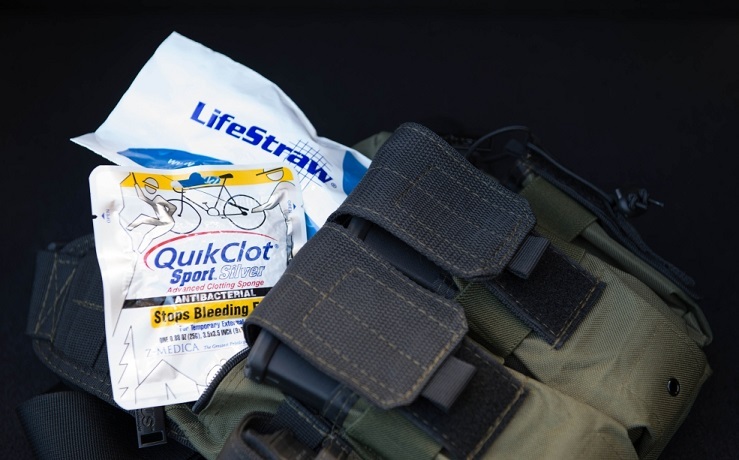 Handgun Planet recommends some variety of QuikClot in any first-aid kit, and one $20 Lifestraw filters over 1,000 liters of water without any harsh chemicals such as chlorine or iodine. To be clear, this isn’t an article advocating that you become a “Doomsday Prepper,” or anything of the sort, but there are some things that could be the difference in life and death in the event that you ever need them, and having a bag full of as many relevant items as possible can’t be anything but good in that situation. This is about having something within reach to get you to your loved ones and give you the ability to better protect them in an emergency, or making sure that you have what you need to get your job done so that you can get back home safely. 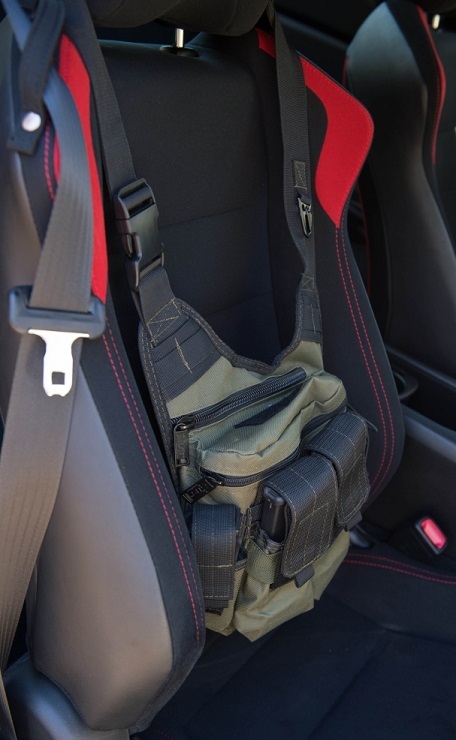 The fact that the Rapid Deployment Pack is small (10″H, 12″W, 3″D) is a distinct advantage over heftier alternatives, because it can be stowed in the back corner of your vehicle’s trunk, underneath the seat (this one might preclude you from being able to leave an extra handgun in there, so be sure to check your local laws on placement of firearms in your vehicle), or even in your truck’s toolbox where it can be safely locked up. *Originally Posted 1/11/2014; Thank you to US Peacekeeper for sending us a sample pack for the purposes of this review. The opinions of the author, however, are his own.